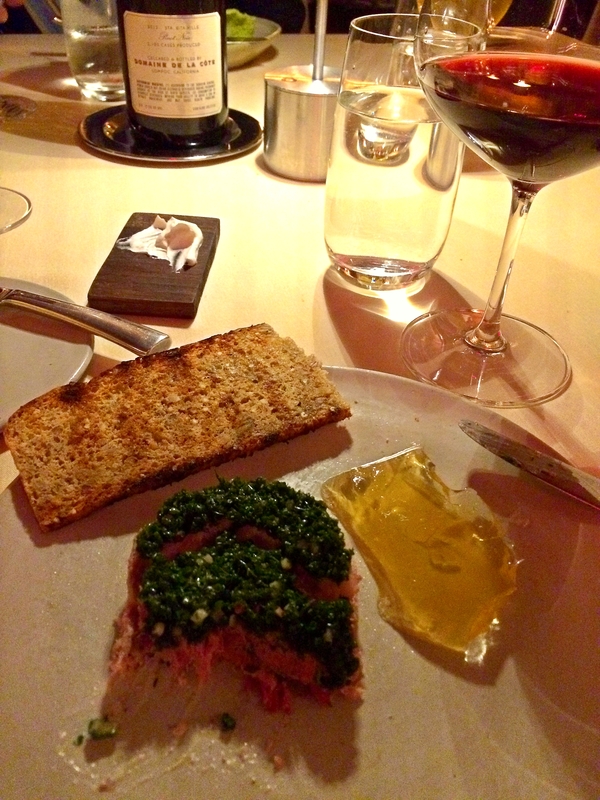 Dining at Betony was a fantastic culinary experience! And I emphasize experience because it’s not every day, for example, that I get to taste ambergris. (More on that later…) The restaurant itself is beautiful- very elegant and classy. There are intricate carvings covering the high ceilings and walls too, which I thought was pretty unique! The dinner started off with what my uncultured self later learned to be called, amuse bouche. Which is officially my favorite phrase at the moment. According to wikipedia, an amuse-bouche is “a single, bite-sized hors d’œuvre.” And I love them! They served a selection of these tiny, cute goodies before and during our dinner. They were all fabulous and included a buttery, sweet foie gras bon bon and this really cool looking pea pureed dollop with a kale leaf scooper. For my first course, I ordered the intimidating Pig’s Head Terrine (also known as head cheese.) It sounded awful. And weird. It was described as having lots of tasty, rich cheek meat in it and basically sounded like a well-seasoned pig head mash up. So, naturally I ordered it! And it was delicious! It paired really well with the mustard flavored jiggly, translucent jello slab and the crunch of the toast served alongside it. My adventurous side paid off! 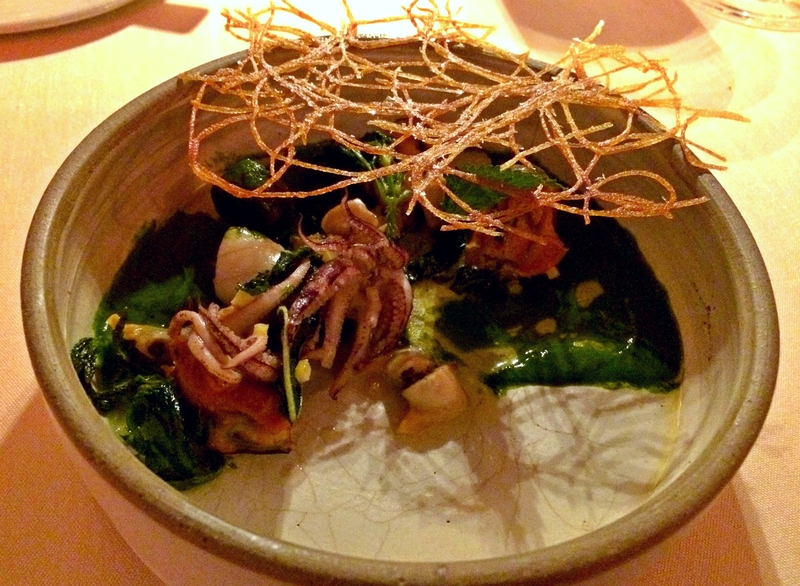 For my second course, I ordered the Shellfish Ragout, served with stinging nettles. It was a very pretty dish- I loved the vibrant, lime green color and the whole presentation! There was a small melody of various tender seafood bites, including octopus tentacles and mussels, in a slightly bitter brothy & frothy sauce. We were pleasantly surprised when the chef, mid-meal, came out with a special treat- yet to be placed on the menu! 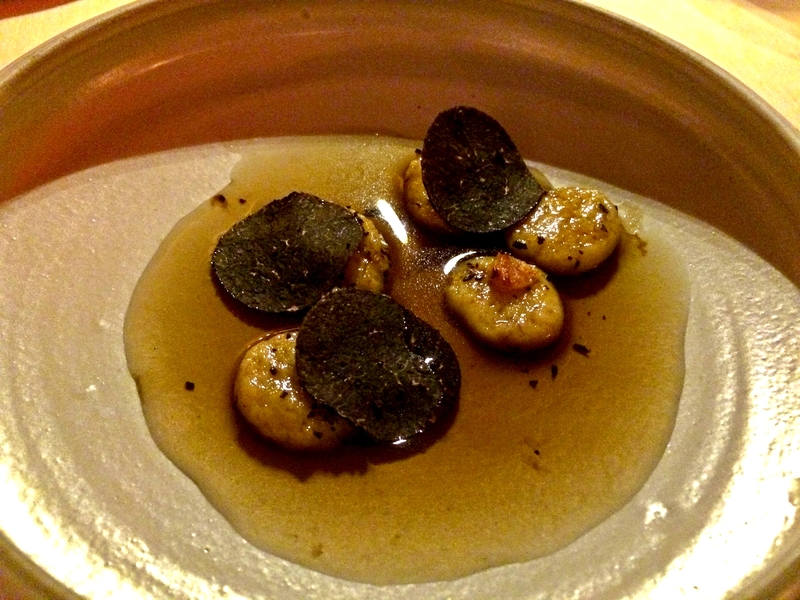 Truffle gnocchi! Whaaaa?! It doesn’t look like much, but it was one of the most savory, rich and flavorful dishes I’ve ever had! That chicken broth doe. Man. If it wasn’t socially unacceptable to lick the bowl clean… well, I would have. 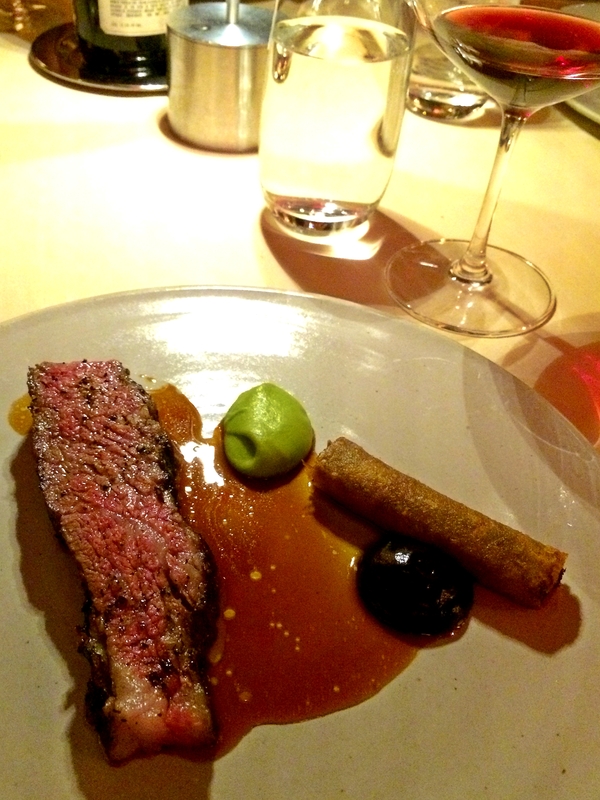 For my main course, I order the Grilled Short Rib which was freaking amazing! I could have eaten like, 5. ALL THE RIBS. Legit melt-in-your mouth deliciousness. So savory and it had that marbled fattiness in the meat that made it so darn tender! It was served with the best lumpia roll I’ve ever tasted in my life. I could have eaten probably 15 of them. And if you don’t know what lumpia is, I feel bad for you. Please make a Filipino friend asap. For dessert? I ordered the heavenly Pandan/ Pistachio creation. 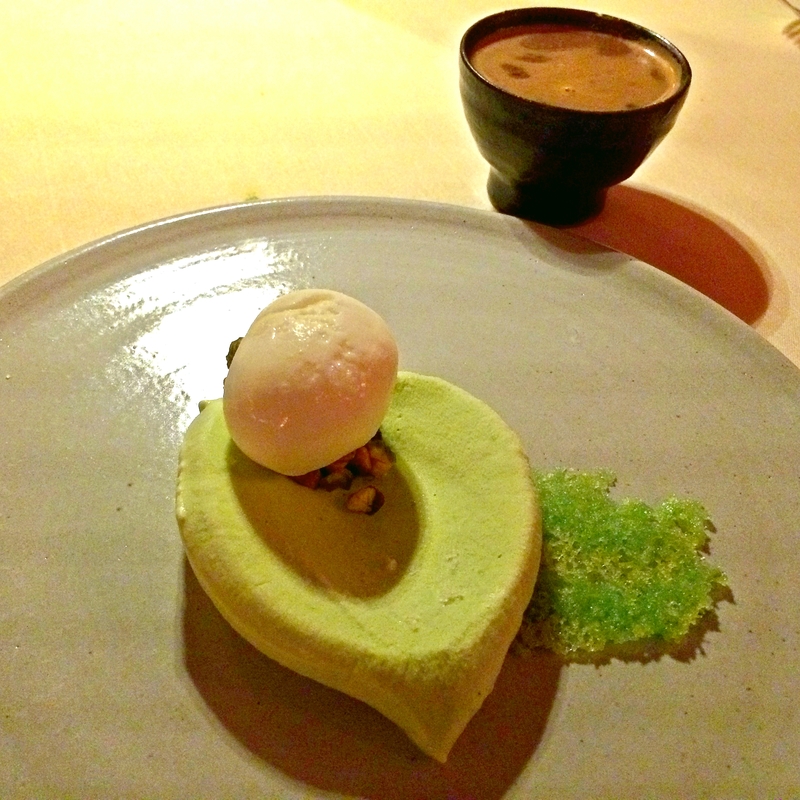 The pandan leaf was dense, frozen, creamy and milky… fantastic! It was set atop a syrup-soaked spongey cake layer and topped with crunchy roasted pistachios. Aka it’s like whale vomit. Or poop. And it’s worth $$$$$. But again, sounds terrible. 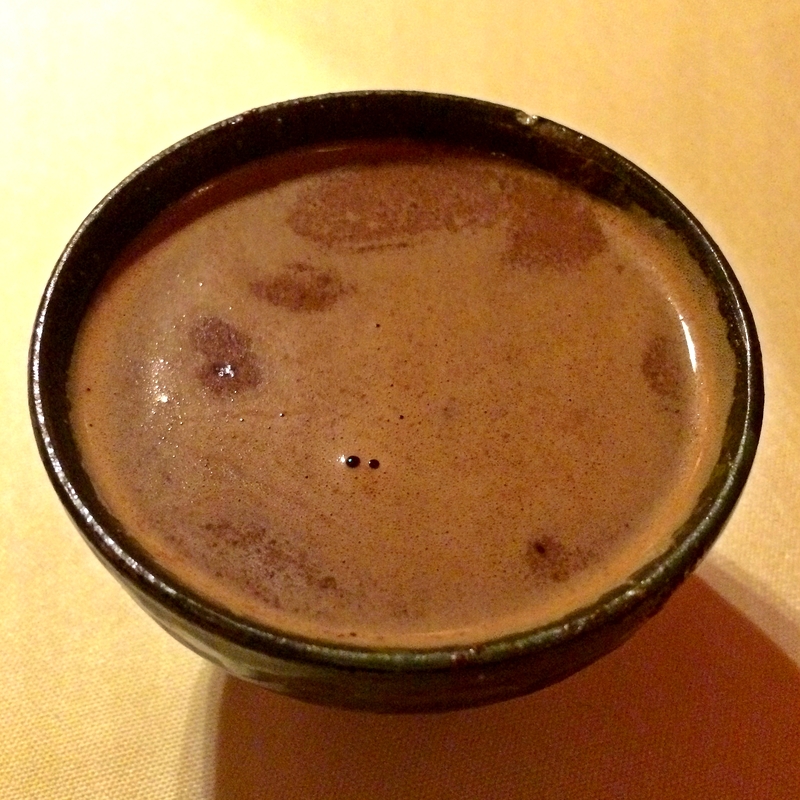 Hot chocolate with ambergris was… not bad at all! The flavor was like the smell of a dude’s underarm b.o. Kinda funky, but very interesting and totally worth saying that I’ve at least tried it! The lovely chef also served us a delicious fancy froyo treat and gave us a delightful parting gift—the best jar of jam ever! I legit want to spread it on all my toast. For the rest of my life. And so concluded an amazing culinary adventure! Previous Post Aerial Yoga Adventures! Haha what a fun experience!! It sounds like you stepped outside your comfort zone to try some new things and I LOVE that!! It looks like a beautiful and expensive meal. Thanks for sharing! It was a fantastic experience- certainly not one I get to have very often! But everything was delicious, and I absolutely recommend the restaurant if you’re ever in NYC 🙂 Lots of unique flavors. Awesome post. And LOL with the lumpia comment. YES! So you know about Lumpia! It’s so delicious!